It’s easy to think that poetry will either inspire love or hate, but there are plenty of different ways to get kids and teens reading it. The recent popularity of Instapoets has brought poetry into the spotlight for a new generation, so now is a great time to keep the language flowing. Share traditional bedtime rhymes and lullabies with little ones courtesy of this cutely illustrated collection. Children and animals frolic on the page with favourites such as Twinkle Twinkle Little Star, Hush, Little Baby and Star Light, Star Bright. For ages 0 and up. 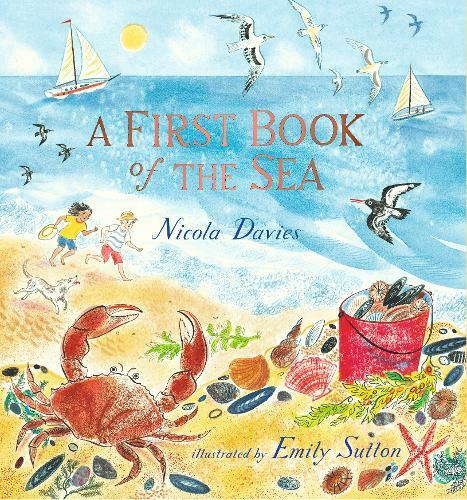 This treasure trove of poems and vibrant illustrations brings the teeming sea and oceans of the world to life, from the Antarctic to Arctic oceans, to islands, reefs, harbours and shipwrecks. Welsh zoologist Davies magically twines together fascinating facts and poetic language, with poems about manta rays, whales and diving. For ages 3 and up. Accomplished Australian writers and illustrators come together to make a fun, eclectic and colourful collection of poems that are perfect for snuggly solo reading, or reciting together with gusto. Visit a strange circus, celebrate fruit salad. Contributors include Stephen Michael King, Sophie Masson, Margaret Wild, Isaiah Nagurrgurrba, Sara Acton, Julie Vivas and more. For ages 4 and up. Author Michael Rosen has created and championed children’s poetry for decades, and here he’s created a fantastic guide for poetry fans and budding young writers. Walking through classic poems by Emily Dickinson, Robert Louis Stevenson, Banjo Paterson, Elizabeth Barrett Browning and his own work, Rosen demystifies the reading and writing process, and introduces useful devices, tools and techniques. For ages 9 and up. Dragonfly Song by Wendy Orr – Mixing together verse and prose, this fascinating story set in Bronze Age Crete follows outcast Aissa as she tries to reclaim her lost identity and survive a year in the ring as a bull dancer. For ages 10 and up. The Crossover by Kwame Alexander – Two basketball-obsessed twin brothers start to drift apart from each other, just as their father’s health takes a turn. For ages 9 and up. Inside Out and Back Again by Thanhha Lai – It’s 1975 and ten-year-old Hà leaves her home in South Vietnam in this vivid recreation of displacement and settling into a bewildering new country. For ages 10 and up. You can find more recommended verse novels for kids here. For decades Plath’s poetry has connected with young people, for its passion, despair and energy. Ariel contains many of her most well-known poems, including ‘Daddy’, ‘Lady Lazarus’ and ‘Edge’. This debut collection by Sydney poet Azam takes the hijab as a starting point to riff on fashion, moral values, spirituality, empowerment, Orientalist stereotypes, discrimination and dating as a Muslim. Teens will connect strongly with Azam’s depiction of emerging adulthood, school, friendship, identity and belonging. It’s impossible to resist dipping into this gorgeous hardcover collection of 366 far-ranging poems. This anthology follows the seasons and the time of year, including complete poems, song lyrics, speeches and extracts from longer works, such as that from Shakespeare’s The Tempest. Each poem and poet has a brief contextual introduction, and there really is something for everyone. An easy introduction to poetic language in all its forms. Melbourne poet Andy Jackson has written a fascinating collection of poems that draw on his personal experiences living with Marfan Syndrome, and an array of 46 historical figures and living interviewees who have, or may have had, the syndrome. Get inside the heads of Abraham Lincoln, Akhenaten, Mary Queen of Scots, Sergei Rachmaninov, Robert Johnson and others in these poems that range from funny to touching to informative. The style of portrait or biographical poem is extremely accessible, and could suit readers who tend to read non-fiction. The Poet X by Elizabeth Acevedo – Dominican-American teen Xiomara is full of fight – against her devout mother, religious doctrine and patriarchy – until the school slam poetry club finally allows her to find her voice and self-acceptance. Sister Heart by Sally Morgan – A young girl is taken from her family, home and country in the north of Australia in this narrative poem that gives a child’s perspective on the Stolen Generations with honesty, hope and humour. Solo by Kwame Alexander – When a shocking family secret is revealed to seventeen-year-old Blade, he leaves behind his drug-addled rock star father and embarks for Ghana, where he finds friendship, community and clarity on his problems. Solo is rife with music references, both real and made up. You can find more recommended verse novels for teens here. Social media has been awash with poetry in recent years, and some of Instagram’s most popular poets have followers that number into the millions. The brevity and accessibility of Instapoetry, as well as the common themes of love, heartbreak and empowerment, have made it very popular with teens. Rupi Kaur – One of the original Instapoets, Kaur is a phenomenon, selling millions of copies of her debut collection, Milk & Honey, and her follow up, The Sun and her Stars. Accompanied by line drawings, Kaur’s poems explore mature themes relevant to older teens such as romance, trauma, sexual assault and eroticism. Lang Leav – Prolific Australian poet (and artist and fashion designer) Lang Leav debuted with Love & Misadventure, which was originally self published. She has since released five more collections of poetry, and a debut novel, Sad Girls. Beau Taplin – Melbourne poet Beau Taplin was originally a songwriter, but has found huge success through his poetry. Originally self published, you can read Taplin’s heartfelt poetry in his collections Bloom and Worlds of You. You can find plenty more Instapoetry suggestions here. Slam poetry is also a great fit for young people, and many schools incorporate writing and performing poetry into their student’s lives. Plus, every year Melbourne Writers Festival hosts the popular grand final of Australian Poetry’s Victorian Student Poetry Slam. This year’s slam is themed OutLoud Eco Slam!. One young poet who has made a major impact in recent years is thirteen-year-old Solli Raphael. When he was just twelve, Solli won the National Australian Poetry Slam Champion, competing against adults. He has now turned his hand to book writing, with Limelight, a collection of original poetry, a primer on different forms of poetry and tips for writing and performing. Limelight is perfect inspiration for keen young writers. For ages 10 and up.